Since it’s Sunday (almost Monday), I thought I would chip into Un-SQL Friday. Before I get down to brass tacks, an explanation is probably in order. Last week, Jen McCown (Blog | @midnightdba) suggested a new blog round table that has nothing to do with SQL Server but is adjacent to SQL Server. This month’s theme for Un-SQL is branding. So there’s no time better than the present to talk about branding. What does it mean to me and my career? What is the purpose behind it and what use to does it provide? The first thing I think about when it comes to branding is generic food. 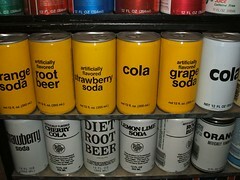 Back when I was a kid, I would visit my grandma and she was a big fan of generic food. Nearly everything in her cupboard was packaged in black and yellow. There was versions of all of my favorite foods. She had cola, macaroni and cheese, hot dogs, and bread. But instead of the company names affixed the packaging and the imagery I was used to – I saw black and yellow staring back at me. The world is much more complicated than that when we purchase food. True, we are primarily driven to buy food to feed ourselves. But we also buy our future meal with the expectation that the it provides more than sustenance. We want an experience and a guarantee that of what it will bring us. This is the point of reference that I was missing from above. When I buy a box of Kraft Macaroni and Cheese I know that it’s going to be the cheesiest. The can of Coke is going to quench my thirst and leave me feeling refreshed. Both of these fill needs through their branding which goes beyond the value that they provide as food. What does this matter to my career? Well, it depends. Yes, a consultants famous last words. But really, it does depend. It depends on what you expect to get out of your career. Five years ago, I worked for a small company here in Minnesota as a full-time DBA. At that time, I would help out co-workers from time to time with SQL Server questions and issues. I was the man in charge of the SQL Server environment and had everything I needed in my kingdom. Outside of work nobody knew me from boo. Things change and I went from working full-time as a DBA to being a SQL Server consultant at Digineer. This was a game changer. I was no longer part of a small team where everyone knew each other’s capabilities and strengths. Now, when I went to a client I had to stand on the strength of my resume and the reputation of Digineer. In the market place, Digineer has a great reputation but this was like selling generic Cola at Byerly’s. Byerly’s provides an experience, but why would you purchase a generic there? The client’s could choose to buy Kraft down the street at Cub Foods. Over the last few years, I’ve worked on my brand and making sure people know what they get by bringing me in on a project. You are likely reading this because of some of my branding efforts, or because of #sqlkaraoke. The development of a brand has led to clients coming to Digineer to work with us and myself based on this brand. Is a brand worth it? Decide for yourself – it has been immensely worthwhile to myself and I feel as though it has provided a lot of comfort in harsh economic times. Lastly a little on the bottom line… yeah, the bottom line has been reflective of the growth of my brand. Previous postWhat are you thankful for?